Wendy Paulson leads a spring birding hike at Penny Road Pond on May 30, 2012. Photo by Cristina Rutter/Forest Preserve District of Cook County. During spring and fall migration, and early nesting season, CFC and Audubon Great Lakes co-sponsor bird walks in local forest preserves and natural areas, including CFC sites. 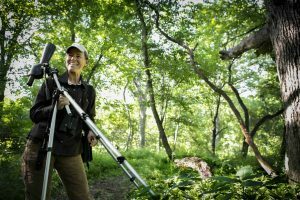 Between bird walks, you can brush up on your bird knowledge and identification skills by visiting Wendy Paulson's series on 365 Barrington, called Birds of Barrington. Barrington Area Bird Hikes this Fall! Get out and enjoy fall migration with Barrington area naturalist Wendy Paulson. Walks are free and open to the public though spaces are limited and RSVPs are required. Good walking shoes are strongly recommended for these walks. Don’t forget your binoculars! Before you head out, please check the calendar on our home page for any last minute changes or cancellations.